Background : The intense development of adhesive restorative materials and parents' preferences for esthetic restorations prompt clinicians to use alternative restorative materials for primary molars. Amalgam, however, is the choice of material when it comes to occlusal stress bearing areas, either in primary or permanent molars. To overcome the drawbacks of amalgam and restorative adhesive materials, the bonded amalgam technique is employed. Aims: To evaluate microleakage and fracture resistance of bonded amalgam in primary molars, and compare it with the microleakage and fracture resistance of high-copper amalgam and composite resin materials. Settings and Design: An in vitro study and 60 caries - free primary molars were used. Subjects and Methods: A total of 60 samples were randomly divided into two equal groups for the evaluation of microleakage and fracture resistance. Class V cavities for microleakage study prepared on 30 samples and Class II mesio-occluso-distal cavities for fracture resistance study on other 30 samples were prepared and randomly divided into three equal groups. Group I received amalgam, Group II received bonded amalgam, and Group III received composite resins. The microleakage was viewed under a stereomicroscope. 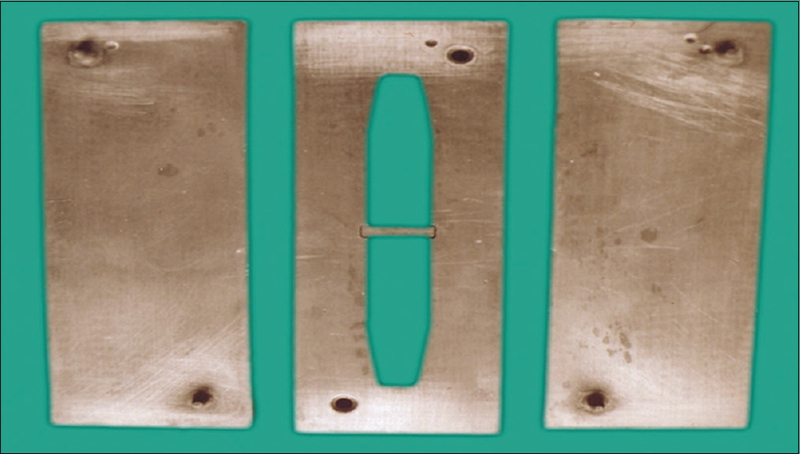 The fracture resistance was evaluated using a universal testing machine. Results: Bonded amalgam exhibited minimum microleakage, when compared to amalgam and composite resin and was found to be statistically insignificant (P = 0.203), while amalgam showed better fracture resistance compared to bonded amalgam and composite resin. It was found to be statistically insignificant (P = 0.144). Conclusions: Bonded amalgam appears to be comparable to amalgam when microleakage is considered and to composite resin when fracture resistance is considered; hence, bonded amalgam can also be an alternative material to amalgam in primary molars. Background: Reduction of upper airway (UA) dimensions during sleep is contemplated to cause reduced sleep efficiency (SE) but a definitive association is not affirmed. 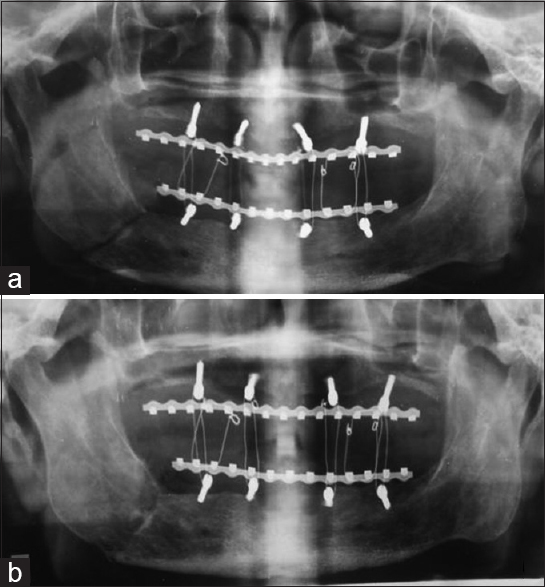 Efficacy of nasopharyngeal appliance (NPA) in management of UA resistance syndrome (UARS) has not been compared with mandibular repositioning splint (MRS). This study intended to assess relation of UA dimensions to SE and effectiveness of NPA. Materials and Methods: Research had two phases: Case-control study to determine association between UA and SE; randomized control trial (with independent concurrent trial groups and double-blind design) to analyze treatment outcome with NPA. Subjects were categorized to three groups of 20 in each: A control group of healthy subjects (Group A); two "Randomly Assigned" sample groups of subjects with reduced SE (Groups B and C). 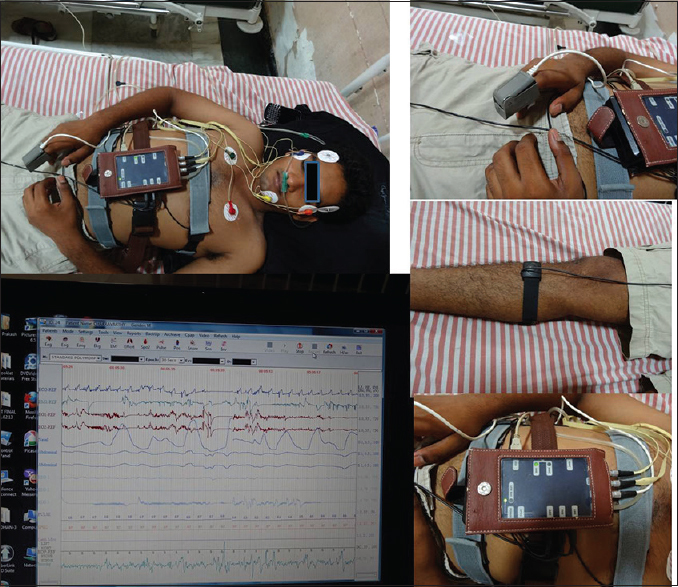 Preliminary questionnaire for sleep analysis, Final data collection sheet (first and second case sheets) were recorded, cephalometric variables analyzed, and diagnostic overnight polysomnography was done to match and confirm selection criteria. Three-dimensional computed tomography was done to analyze airway dimensions before and after appliance placement. ANOVA and post-hoc tests were used for statistical analysis of results. Conclusions: Reduced UA dimension during sleep is associated with reduced SE; NPA gives better improvement for UARS than MRS.
Background and Objectives: This study was designed to evaluate whether the oral administration of lactobacilli could change the bacterial population in subgingival plaque. Subjects and Methods: Forty-two healthy volunteers with chronic generalized mild to moderate periodontitis were given a probiotic drink containing Lactobacillus casei for 1 month. Subgingival plaque samples were collected at baseline, after which the patients were asked to consume the probiotic drink once daily for 1 month. At the 1 month interval, plaque samples were collected, and the drink discontinued. 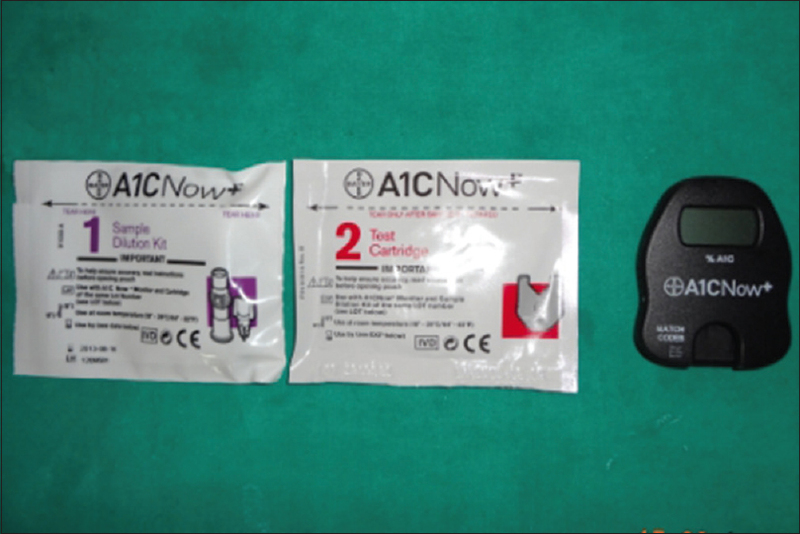 The patients were recalled at 2 months interval for collection of the final samples. The bacterial amounts in the plaque samples were analyzed by multiplex polymerase chain reaction procedure. Results: Of the three periodontopathic bacteria selected, Porphyromonas gingivalis showed highly significant reductions in the bacterial levels at 1-month and 2 months intervals. In comparison, Aggregatibacter actinomycetemcomitans, when present higher than 10 × 10 3 at baseline, and Prevotella intermedia present higher than 2 × 10 3 at baseline, showed moderately significant reduction in their numbers. Interpretation and Conclusion: Oral administration of the probiotic lactobacilli reduced the numerical sum of the three selected periodontopathic bacteria and could contribute to the beneficial effects on periodontal conditions. Introduction: Craniofacial growth of the skeleton and soft tissue influences the final configuration of occlusion and overall facial esthetics. Materials and Methods: Two hundred samples were taken from Himachali ethnic population with age ranging from 18 to 28 years. The records will then be scaled to life size and landmarks will be located on the digitized image to obtain all linear and angular measurements. Results: The parameters were analyzed using SPSS Statistics Software version 11.5. Student's t-test was conducted for comparison between male and female subjects. The reproducibility of the measurements was analyzed using Dahlberg's (1940) formula. To determine the difference between two measurements, made at least 2 months apart, 25 randomly selected records were redigitized. Conclusion: Himachali males and females show considerable sexual dimorphism with less prominent nose, less protrusive lower lip, and more chin height in males whereas females had more convex profile, less protrusive upper lip, and more tipped nose. Introduction: Sodium hypochlorite (NaOCl) has long been the most preferred root canal irrigant in endodontic treatment, but besides being an effective anti-microbial agent, it is highly cytotoxic. Thus, a search for an alternative herbal irrigant which would be more biocompatible but equally effective led to this study. Aim: To assess the anti-microbial efficacy of garlic extract (GE) against Enterococcus faecalis biofilm and its ability to penetrate into root dentin. Materials and Methods: E. faecalis was cultured and treated with the test agents - normal saline, 5.25% of NaOCl, and the three different concentrations of GE (10%, 40%, and 70%). The experiment was done in four groups namely, 24-h Co-treatment group, 24-h biofilm treatment group, 1-week biofilm group, and 3-week biofilm group. These groups were subjected to microbial viability assay and fluorescence microscopic analysis. The most effective concentration of garlic (70%) was further tested and compared with 5.25% NaOCl for its dentin penetration property using 0.2% alizarin red under a fluorescence microscope. Results: The findings revealed that GE was able to disrupt as well as prevent the formation of biofilm produced by E. faecalis. All the concentrations of GE displayed considerable anti-microbial efficacy where 70% concentration was most effective and exhibited similar anti-microbial efficacy as 5.25% NaOCl. In terms of dentin penetration, no significant difference was found between GE and NaOCl. Conclusion: The results indicate that GE has a potential to serve as an alternative herbal root canal irrigant being an effective and biocompatible anti-microbial agent with good dentinal penetration property. Context: Palm prints formed once does not change throughout life and is not influenced by environment. Palmar Dermatoglyphics can indicate the development of potentially malignant and malignant lesions and help in identifying persons at high risk of developing Oral submucous fibrosis (OSMF) and Oral squamous cell carcinoma (OSSC). Aim: To analyze the qualitative [finger ridge pattern and presence or absence of hypothenar pattern] and quantitative [mean ATD angle and total AB ridge count] variations in Palmar Dermatoglyphics in patients suffering from OSMF and OSCC. Settings and Design: A prospective comparative study among 40 patients (Group I-10 samples of smokeless tobacco users with OSMF, Group II- 10 samples of smokeless tobacco users with OSCC, GroupIII- 10 samples of smokeless tobacco users without OSMF or OSCC and GroupIV- 10 samples without smokeless tobacco habit without OSMF and OSCC as controls) were selected. Materials and Methods: The palm prints were recorded using an HP inkjet scanner. 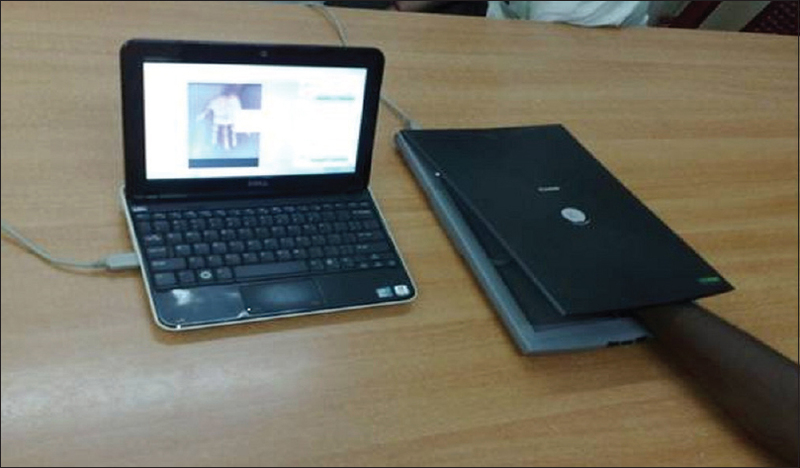 The patients were asked to place the palm gently on the scanner with the fingers wide apart from each other. The images of the palm prints were edited and qualitative and quantitative analysis were done. Statistical Analysis Used: Statistical analysis such as Kruskal Wallis, Post Hoc and Analysis of Varience were done. Results: A highly significant difference among the finger ridge, hypothenar pattern and mean ATD angle (P<0.001) and total AB ridge count (P=0.005) in OSMF and OSCC patients were obtained. There is predominance of arches and loops, presence of hypothenar pattern, decrease in mean ATD angle and total AB ridge count in OSMF and Oral Cancer patients. Conclusion: Palmar Dermatoglyphics can predict the probable occurrence of OSMF and OSCC in smokelees tobacco users. Context: Tongue-tie (more formally known as ankyloglossia) is a congenital anomaly characterized by an abnormally short lingual frenulum, which may restrict mobility of the tongue tip impairing its ability to fulfill its functions. The clinical significance of ankyloglossia is varied; rarely symptomatic to a host of problems including infant feeding difficulties, speech disorders, malocclusions, and others. Aims: The need of this study was to evaluate the occurrence and severity of tongue-tie and its association with the type of malocclusions in two populations and also to correlate the various malocclusion traits with the grades of tongue-tie. Subjects and Methods: A total of 700 school children in the age group of 9-17 years were examined for the presence of tongue-tie, 350 from regular schools and 350 from special schools. The presence was evaluated, measured, and graded into Grades I-V according to Kotlow's method. The malocclusion was assessed according to Angle's classification. Severity of crowding was assessed by Little's irregularity index in each case. Various other malocclusion traits were visually assessed, in relation to the positions of the teeth. Statistical Analysis Used: Spearman's rank correlation method was used to test the relationship between type of malocclusions, grades of tongue-tie and severity of crowding. Significance was considered at the (P < 0.05) level. Results: Statistically significant differences were seen between grades of tongue-tie and Angle's types of malocclusion and Spearman's correlation between them showed negative correlation. The Spearman's correlation showed a negative correlation between tongue-tie grades and severity of crowding. 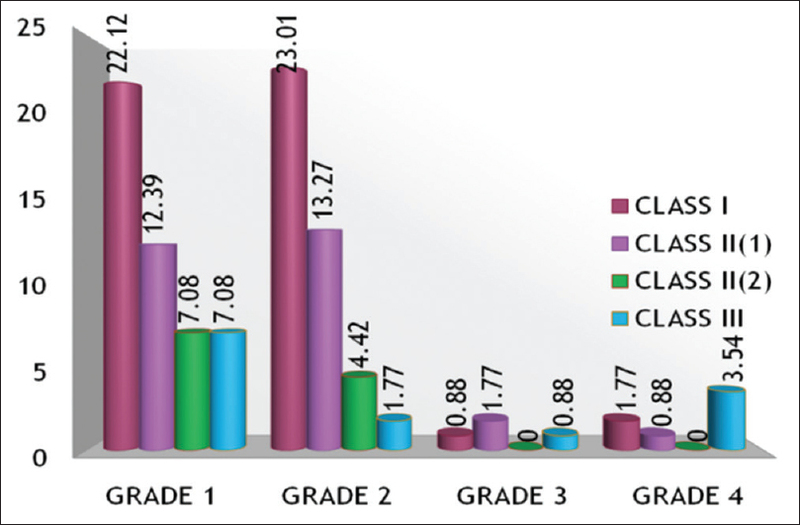 Conclusions: As the grade of tongue-tie increased, its association with Classes I and II malocclusion decreased. The lower grades of tongue-tie are associated with increased lower incisor crowding. Shorter, tight frenulums are more associated with maxillary constriction, anterior open bite, and spacing of the lower anteriors. Aim: To assess the oral health status and treatment needs among elderly people aged 60 years and above residing as inmates in the old age homes of Hyderabad and Secunderabad, Andhra Pradesh, India. Settings and Design: A cross-sectional study was performed to determine the oral health status and treatment needs among elderly people. Materials and Methods: In order to assess the oral health status and treatment needs, the clinical assessment of oral mucosa, community periodontal index, loss of attachment, dentition status and treatment need, prosthetic status and prosthetic need was recorded based on a modified World Health Organization 1997 proforma. Statistical Analysis Used: Multi-group analysis was done using analysis of variance. P < 0.05 was considered statistically significant. Results: Of the 812 inmates, 431 (64.0%) of the study participants had oral mucosal lesions. In terms of periodontal status, all sextants were excluded (Code "X") in 324 (39.9%) subjects. Out of dentate population, a majority of the inmates (219; 27.0%) presented with deep pockets (Code "4") followed by shallow pockets (Code "3" - 183; 22.5%). The majority of the subjects had no prosthesis in the upper arch (85.0%) and lower arch (86.6%). Conclusion: The study demonstrated poor oral health among institutionalized elderly inmates. Oral mucosal lesions were found to be higher and periodontal status was also poor amongst the study population. Background: HsCRP (Highly sensitive C reactive protein) is a global indicator for future vascular events in adults detected in blood stream 48 hours before the cardiovascular event. Periodontal disease may increase blood levels of inflammatory markers like IL-6, CRP and HsCRP. Hence the aim of the present study is to evaluate the presence of elevated HsCRP levels in chronic periodontitis patients. Material and Methods: 100 patients who reported for cardiac master health check up were enrolled in the study. The periodontal status was assessed using periodontal probing pocket depth and clinical attachment level. The decayed, missing and filled tooth was recorded using DMFT index. The venous samples of these patients were obtained for recording HsCRP levels. Results: Pearson correlation was used to analyze the relationship between HsCRP level and probing pocket depth, clinical attachment loss and DMFT. The correlation value was 0.051, 0.025 and 0.101 respectively, the correlation is statistically significant for probing pocket depth and clinical attachment level (P>0.05). Chi- square test was performed to study the association between gender and HsCRP, Diabetes Mellitus and HsCRP and Hypertension and HsCRP; the results showed that there is no significant association between any of the above mentioned factors and HsCRP level in blood. Conclusions: We found an increased level of HsCRP in patients with chronic periodontitis which revealed the susceptibility of these patients to cardiac diseases like myocardial infarction and stroke. Hence present day focus in the line of management of cardiac patient has changed from the periodontal perspective. Objective and Background: Glycosylated haemoglobin (HbA1c) level can consequently be interpreted as an average of the blood glucose present over the past 3-4 months. Periodontitis is associated with glycemic control in patients with diabetes. The purpose of this study was to determine the level of HbA1c in healthy and periodontitis patients who were previously not diagnosed with diabetes mellitus. Materials and Methods: A total of 40 patients were selected for study and divided into two groups. Group 1 included patients with a healthy periodontium, and Group 2 included patients suffering from chronic periodontitis. Finger stick blood was collected by special collection unit (A1CNOW +® Bayer Health Care, Tarrytown New York, USA), for estimating level of HbA1c. Result: Both groups showed similar HbA1c levels clinically with slight increase in levels in the test group, but was statistically significant (test - 5.66 ± 0.35%, control - 5.17 ± 0.3% P = 0.003). Conclusion: Indians are at a high-risk of developing periodontitis and diabetes. These data suggest a possible link between periodontitis and glycemic control in nondiabetic individuals, periodontal disease may be a potential contributor to the development of type 2 diabetes. Introduction: Hydrochloric acid (HCl) from the gastric juice is the only source of intrinsic acid, which can reach the oral cavity in cases of gastroesophageal reflux or chronic vomiting, enhancing the risk of dental erosion. Aim: Compare the effects of mouthrinses with different active agents in the prevention of initial dental erosion caused by HCl. Subjects and Methods: Casein (CAS at 0.2%), sodium hexametaphosphate (HMP at 0.02%), titanium tetrafluoride (TiF 4 at 0.34%), and stannous fluoride (SnF 2 at 0.87%) were individually added to an experimental mouthrinse. The mouthrinse without additives was used as the negative control (C) and a commercially available mouthrinse for erosion (ELM - Elmex ® ) as the reference product. Enamel specimens were exposed to human saliva and randomly assigned to 6 experimental groups (n = 8). Specimens were submitted to erosion in HCl for 10 s, followed by to the experimental mouthrinses for 30 s, and artificial saliva for 60 min. This cycle was repeated 3 times. The total amounts of calcium and phosphorus released by the specimens in the 2 nd and 3 rd erosive challenges were evaluated by atomic emission spectrometry. Statistical analysis used Shapiro-Wilks and Hartley tests, followed by one-way ANOVA and Tukey tests. 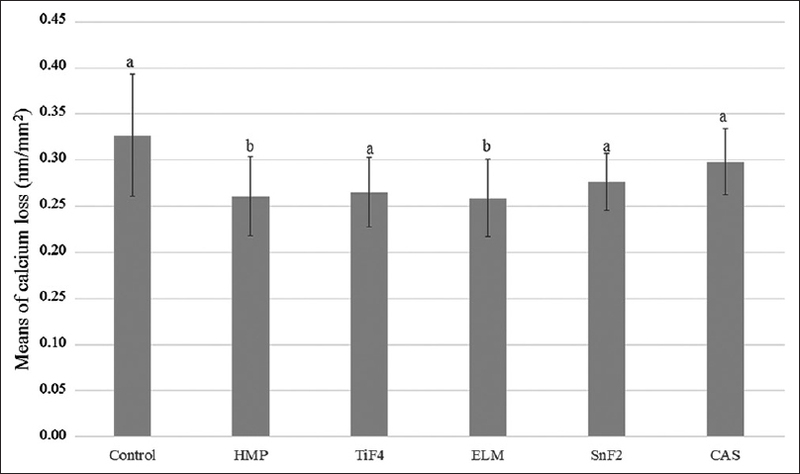 Results: When compared with C, ELM and HMP presented significantly less calcium in solution, with no difference between them. All the groups showed similar and significantly less phosphorus than C, except CAS. Conclusions: HMP was the only agent that could match the protection against initial erosion of the commercially available mouthrinse in both analyses. Purpose: To examine, evaluate, and compare the tensile bond strength of two silicone-based liners; one autopolymerizing and one heat cured, when treated with different chemical etchants to improve their adhesion with denture base resin. Materials and Methods: Hundred and sixty test specimens of heat-cured polymethyl methacrylate (PMMA) were fabricated; out of which 80 specimens were tested for tensile bond strength after bonding it to autopolymerizing resilient liner (Ufigel P) and rest 80 to heat-cured resilient liner (Molloplast B). 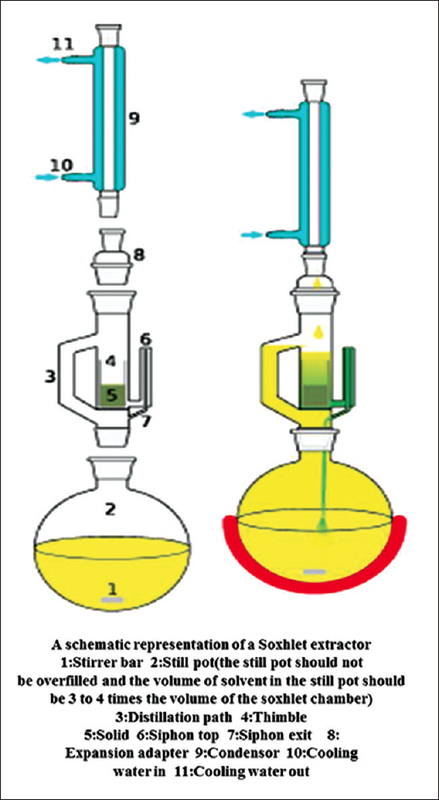 Each main group was further divided into four subgroups of 20 specimens each, one to act as a control and three were subjected to surface treatment with different chemical etchants namely dichloromethane, MMA monomer, and chloroform. The two silicone-based denture liners were processed between 2 PMMA specimens (10 mm × 10 mm × 40 mm) in the space provided by a spacer of 3 mm, thermocycled (5-55°C) for 500 cycles, and then their tensile strength measurements were done in the universal testing machine. Results: One-way ANOVA technique showed a highly significant difference in the mean tensile bond strength values for all the groups. The Student's t-test computed values of statistics for the compared groups were greater than the critical values both at 5% and at 1% levels. Conclusion: Surface treatment of denture base resin with chemical etchants prior to the application of silicone-based liner (Ufigel P and Molloplast-B) increased the tensile bond strength. The increase was the highest with specimens subjected to 180 s of MMA surface treatment and the lowest with control group specimens. Context: Endo-PTC are used during endodontic treatment; however, until now no study evaluated the cleaning of dentin walls after use of different Endo-PTC formulations. 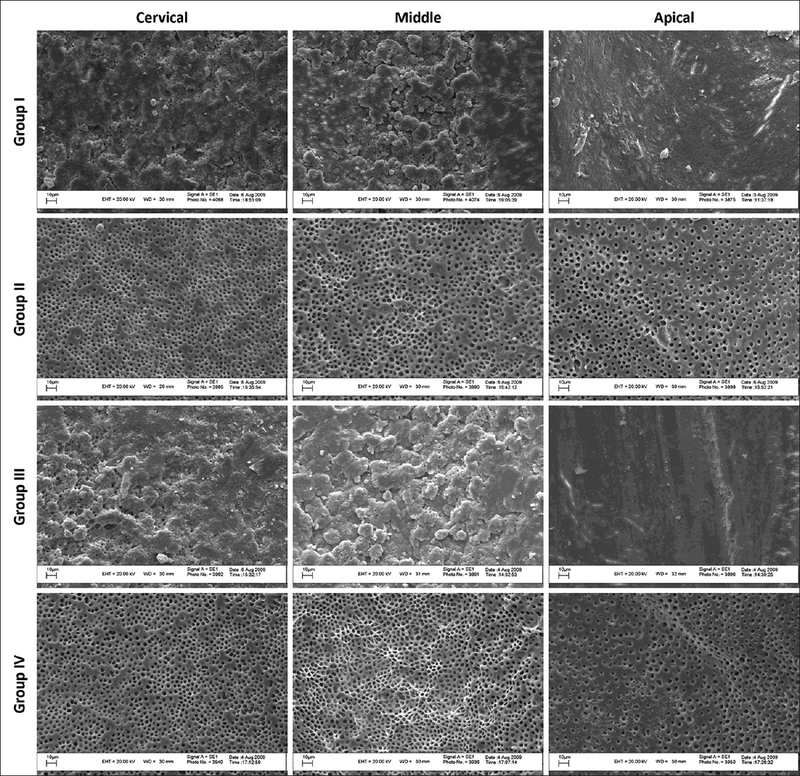 Aims: The aim of this study was to assess qualitatively, by means of scanning electron microscopy (SEM) images, the cleaning of dentin walls of root canals after chemomechanical preparation (CMP) using Endo-PTC cream and Endo-PTC light associated to 2.5% sodium hypochlorite and 17% ethylenediamine tetraacetate (EDTA). Materials and Methods: Forty single-rooted human maxillary central incisors with straight canals and fully formed apex were selected. The specimens were randomly divided into four groups depending on the type of Endo-PTC and the final rinse with 17% EDTA. After CMP, all specimens were sectioned and processed for observation of the apical thirds by using SEM. Three calibrated evaluators attributed scores to each specimen. Statistical Analysis Used: The differences between irrigation protocols were analyzed with Kruskal-Wallis test followed by Bonferroni adjustment for multiple comparisons. The significance level was set at α = 0.05. Results: The use of Endo-PTC cream or Endo-PTC light did not influence the smear-layer (SL) removal (P > 0.05). When EDTA were used, it was obtained the best cleaning results with no significant difference between the substances (P < 0.05). Conclusions: It can be concluded that EDTA is essential to promote SL removal which was not affected by the type of Endo-PTC formulation. Context: Sodium hypochlorite is the most widely used irrigant in endodontic practice, but it has various disadvantages. 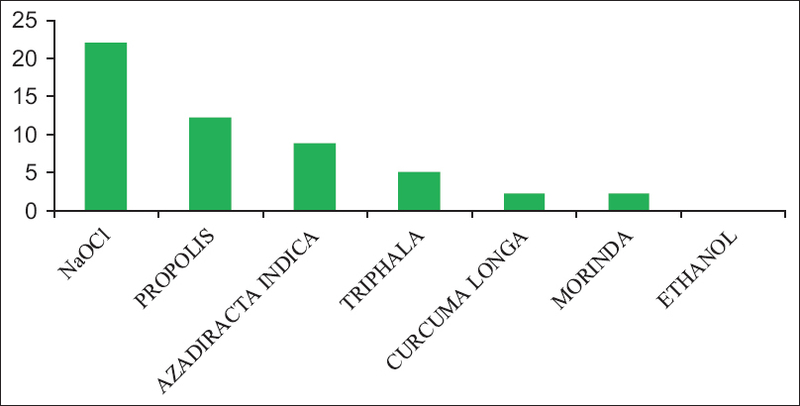 Literature has shown that herbal products such as Propolis, Azadirachta indica (AI), Triphala, Curcuma longa, and Morinda citrifolia (MC) possess good antimicrobial properties and thus can be used as potential endodontic irrigants. Aim: To evaluate and compare the antimicrobial activity of five herbal extracts, i.e., Propolis, AI, Triphala, C. longa, and MC with that of 2.5% sodium hypochlorite against Enterococcus faecalis. Materials and Methods: E. faecalis American Type Culture Collection 21292 was inoculated onto brain heart infusion agar plate. Discs impregnated with herbal medicaments were placed on the inoculated plates and incubated at 37°C aerobically for 24 h and growth inhibition zones were measured. Statistical Analysis: Mean zone of inhibition in descending order was found as sodium hypochlorite > Propolis > AI > Triphala > C. longa = MC > ethanol. Statistical analysis was performed using one-way analysis of variance which showed a significant difference in the zone of inhibition of sodium hypochlorite and Propolis (P < 0.001). Results: Propolis showed highest zone of inhibition among all the herbal extracts next to sodium hypochlorite. Conclusion: Propolis and AI have significant antimicrobial activity against E. faecalis. Background: Repeated endodontic failures are due to pathogens like Enterococcus faecalis and Candida albicans which are resistant to the common intracanal medicaments like calcium hydroxide (Ca[OH] 2 ). Aims: To determine the role of commonly used folk medicine, Spilanthes acmella (SPA) against root canal pathogens like E. faecalis, C. albicans, Staphylococcus aureus, Streptococcus sp, and to compare its efficacy with Ca(OH) 2 , a popularly used intracanal medicament. Materials and Methods: Bacterial strains of S. aureus, Streptococcus sp., E. faecalis, and fungal strains of C.albicans were tested against different concentrations of SPA and Ca(OH) 2 . Seven days old cultures of test organisms were seeded onto agar plates and uniformly spread with a spreader. Five to six wells (8 mm) were made on agar plate to which different concentrations of the test solutions were added. The inoculated plates were kept in an incubator at 37°C for 48 h and inhibition zones were measured. Statistical Analysis: Results of SPA were compared with results of Ca(OH) 2 statistically using Mann-Whitney U test. Results: A significant zone of inhibition was obtained with SPA and was found to increase as the concentration increased for C. albicans. SPA showed a significant zone of inhibition at 2-5% and 10% whereas Ca(OH) 2 showed a zone of inhibition only at 10% for E. faecalis. SPA showed a zone of inhibition only at 10%, whereas, Ca(OH) 2 showed a significant zone of inhibition at 5% and 10% for S. aureus and Streptococcus sp., respectively. Conclusion: SPA possesses remarkable antibacterial and antifungal activity against common root canal pathogens which are responsible for repeated endodontic failures such as E. faecalis and C. albicans when compared with medicaments like Ca(OH) 2 . Context: Antibiotic resistance is a major problem with inadvertent usage. Thus, there is a need to search for new antimicrobial agents of herbal origin to combat antibiotic resistance. One such plant is Morus alba which has a long history of medicinal use in traditional Chinese medicine. Aim: To compare the antibacterial activity of ethanolic extract of M. alba leaves with chlorhexidine gluconate against Aggregatibacter actinomycetemcomitans, Porphyromonas gingivalis, and Tannerella forsythia. Settings and Design: Experimental in vitro study. Methodology: Crude extract from the leaves of M. alba were prepared by Soxhlet extraction method by using ethanol as a solvent. Minimum inhibitory concentration (MIC) of the extract was assessed against A. actinomycetemcomitans, P. gingivalis and T. forsythia, and compared with that of chlorhexidine gluconate by broth dilution method. Results: P. gingivalis was the most sensitive organism against the M. alba extract with an MIC value of 1.95 mg/ml; while T. forsythia and P. gingivalis both were most sensitive organisms against chlorhexidine gluconate with MIC values of 0.00781 mg/ml. Conclusion: M. alba possess good antibacterial activity against A. actinomycetemcomitans, P. gingivalis and T. forsythia and thus would be beneficial for the prevention and treatment of periodontal disease. However, chlorhexidine gluconate was found to be more effective when compared to M. alba. Context: The increasing use of chewing tobacco (CT) in the last 10-12 years has led to an increased incidence of potentially malignant oral disorders and frank oral malignancies. 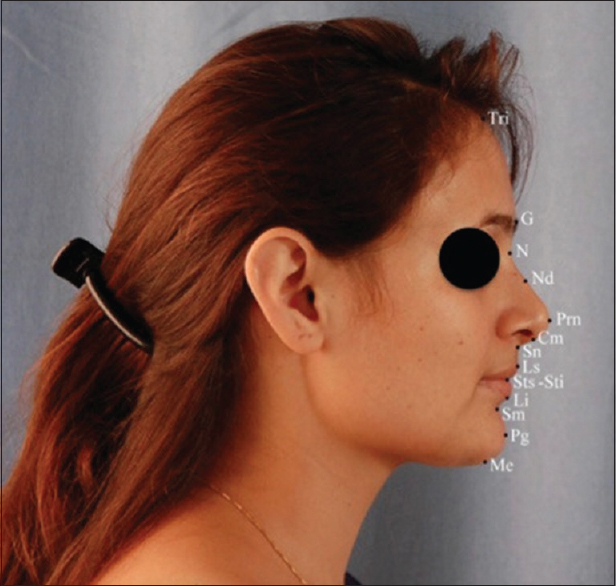 Aim: To determine the frequency of oral mucosal lesions and to correlate the dose-response relationship among CT users of Bengaluru North province. 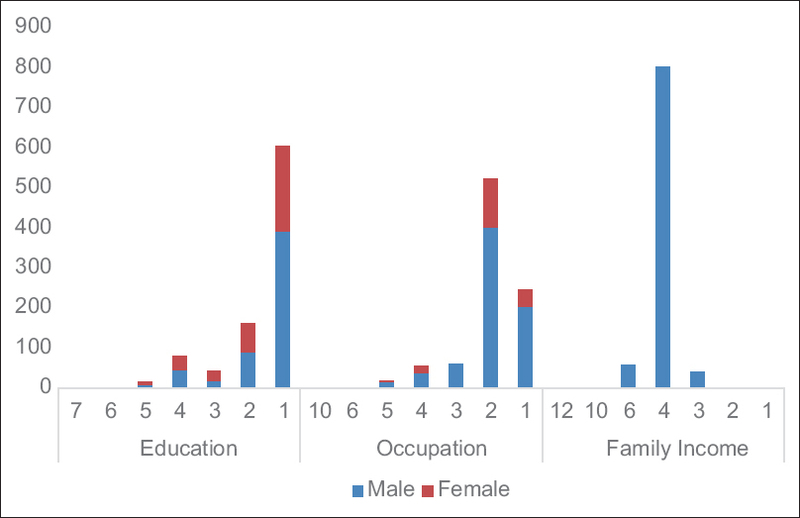 Settings and Design: This population-based cross-sectional study was conducted among a randomized cluster sample of adults in low-income group (slums), of Bengaluru North, Karnataka state, India. Materials and Methods: Nine hundred and one subjects, all CT users were surveyed in this cross-sectional study. A prestructured questionnaire which included information on type and amount of CT used, duration and frequency of use, and location of placement of tobacco in the oral cavity was used for assessment, which was followed by oral examination for the presence of lesions. Statistical Analysis Used: Chi-square and Fisher's exact tests were used to assess the statistical significance. Results: Of the 901 subjects with CT habits, 55.8% revealed no clinically detectable oral mucosal changes and 44.1% showed mucosal changes of which 63.8% were males and 36.1% were females. The most common finding was chewers mucositis (59.5%) followed by submucous fibrosis (22.8%), leukoplakia (8%), lichenoid reaction (6.5%), oral cancer (2.7%), and lichen planus (0.5%). Conclusion: This study provides information about different CT habits and associated mucosal lesions among this population. Fracture of an edentulous mandible is a difficult task primarily due to the absence of teeth. The management becomes even more difficult if the patient is geriatric and osteoporotic. A simple technique of using bite block splint, maxillomandibular fixation screws, and intermaxillary fixation has been presented to enable healing of fracture of mandible in such cases. The technique, which crosses the boundaries of conventional fracture management provides, promising results with minimum morbidity thus imparting optimum quality of life ahead for the patient. The presence of dens invaginatus (DI) and dens evaginatus (DE) on same tooth is a rare phenomenon. However, when these dental anomalies occur on a double tooth, it becomes an extremely rare phenomenon. 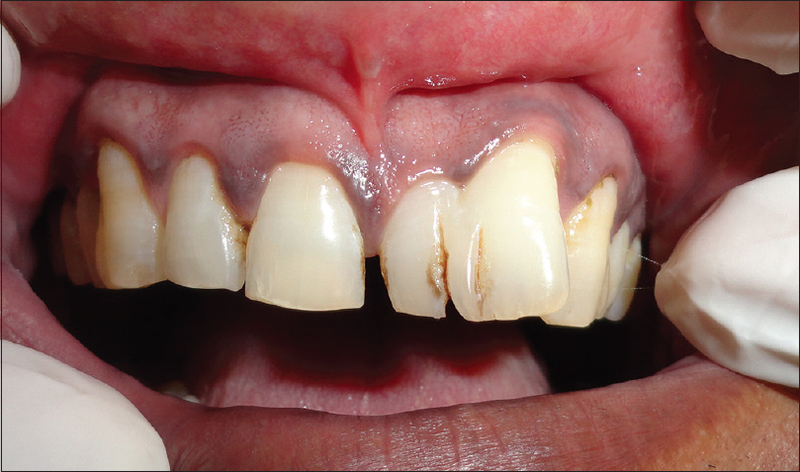 The authors report a rare case of DI and DE on fused permanent maxillary central incisor with supernumerary tooth in a 40-year-old male. The present article also focuses on the differentiating fusion from gemination and also reviews preventive and management strategies for tooth with complex dental anatomy. Necrotizing sialometaplasia (NSM) is a rare benign, inflammatory disease of both major and minor salivary glands, although more commonly reported in the minor glands of the palate. The characteristic clinical presentation can perplex the clinician and may be mistaken for a malignant neoplasm, such as mucoepidermoid carcinoma, as well as invasive squamous cell carcinoma. The clinical and histological similarity between this entity and a malignant lesion may result in unnecessary or mis-treatment. Though clinically mimics malignancy, NSM is considered to be a self-limiting disease, and takes about 3-12 weeks to resolve. Majority of the case resolves itself or by supportive and symptomatic treatment. Surgical intervention is rarely required in NSM except the diagnostic biopsy. Herein we report the clinical, histopathological feature and surgical management of a case of NSM of hard palate in a young adult male.